When the Yankees picked up 28-year old Chris Martin in a trade with the Rockies this winter, I thought it was a good thing because we’d all get to make some Coldplay jokes for a month before never hearing from the Arlington, TX native again. Martin proved that he wasn’t just a pun waiting to happen. Instead made the Yankees bullpen, and he’s been impressive so far in his stint. It also turns out he has a pretty fantastic backstory. I have a feeling we’ll be seeing a lot of Chris this season, so let’s get to know him a little better, with a little help from Coldplay. Martin’s journey to the major leagues certainly didn’t start off on the right foot. After a promising high school career at Arlington High, he was drafted in the 18th round of the 2004 draft by the Tigers, but he decided to attend college instead. He pitched well enough at McLennan Community College to get drafted in the 21st round by the Rockies in 2005, but again the porridge wasn’t quite right, so Chris returned to McLennan. That fall, he tore the labrum in his pitching shoulder. According to an interview he did with Scott Miller in April of last season, the injury not only derailed his career, but basically his entire life. Without baseball, Martin had little direction, and the classes he had stopped attending at McLennan eventually caught up to him and he had to leave school. He had shoulder surgery in 2007 and, after a failed tryout with an independent league team, he quit baseball all together. Martin ended up going back home to Texas and got jobs at Lowe’s Hardware and UPS. He was no longer delivering fastballs, he was delivering packages. He eventually started working at Texas Appliance, where his job was to stock “a bunch of high end stuff,” like washers and dryers. According to Miller’s piece, it was one night while working at Texas Appliance that he decided to have a catch with an old friend, who realized Martin was again throwing gas. That game of catch, four years after he thought his career was over, ended up pushing him to try out for the independent American Association’s Grand Prairie AirHogs. The AirHogs’ manager was none other than former forgotten Yankee Pete Incaviglia, who immediately called a scout with the Red Sox, who got Martin a tryout with the team. Almost as if it were a scene from a movie, Martin showed up to the tryout (he had to pay his own way, by the way) throwing in the mid 90s, and was signed. Eventually, the Sox traded him to the Rockies, which is where he finally made his major league debut last April, about eight years after he’d thrown his last competitive pitch. Chris Martin was back. This past offseason, the Rockies had to designate Martin for assignment in order to sign Nick Hundley, so they traded him to the Yankees for cash considerations. 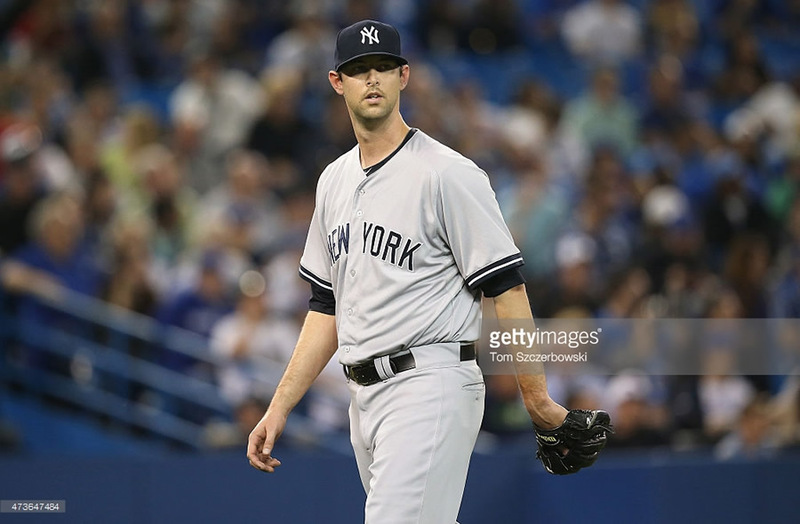 After a strong spring, and possibly because Chris Capuano got hurt and Adam Warren had to move up to the rotation, Martin made the Yankees 25-man opening day roster as a reliever. Martin took his turn on Opening Day, and it certainly was all yellow in his Yankees debut. He was brought in to pitch the fifth inning after Masahiro Tanaka‘s poor outing, and had to face Jose Bautista, Edwin Encarnacion and Josh Donaldson, one of the better 3-4-5s in the league. Martin struck them all out. That’s how you start your Yankees career. Overall so far, Martin has pitched in two innings without allowing a base runner, which is more than you could have asked him for coming into spring training. If Martin really has come all the way back, I really think the Yankees might have found one of those diamonds in the rough that everyone talks about. Historically, the Yankees have gotten a lot out of these “out of nowhere” guys, at least for a limited time. Guys like David Weathers, Jason Grimsley, Tanyon Sturtze, Aaron Small, Shawn Chacon and Cory Wade have all contributed to World Series or deep playoff runs at one point or another in the last 20 years or so. I’m not saying the Yankees are better at this than other teams, but it’s something they’ve always been able to do through good scouting and front office shrewdness, and Martin could be another example of that. He has a lot going for him. First of all, Martin is 6’8″, so he might as well be handing the ball to the catcher a la Jeff Nelson, although he throws more from a 3/4 arm angle than Nelson’s submariner delivery. Martin throws his fastball in the mid 90s, and, at least thus far, has featured a pretty good looking slider and a change up. You don’t strike out Bautista, Encarnacion and Donaldson in a row unless you’re bringing something good to the table. Also, at just 28 years of age, he is still relatively young, and could have a lot of good years left in his arm if the shoulder holds up. I, for one, am looking forward to seeing what he can do this season. He could either be a big time contributor to a dominant bullpen, or a silver lining if the Yankees’ season doesn’t go as well as we all hope it does. He could always end up failing, but who wants to think about that?